News came that Miles Morales will be appearing in upcoming episodes of Disney XD’s series “Ultimate Spider-Man.” This particular incarnation of Spidey on TV features a fourth-wall-breaking Peter Parker being trained in heroics by Nick Fury of SHIELD. Peter isn’t alone in his training; accompanying him in training are fellow teen heroes Luke Cage, White Tiger, Nova, and Iron Fist. 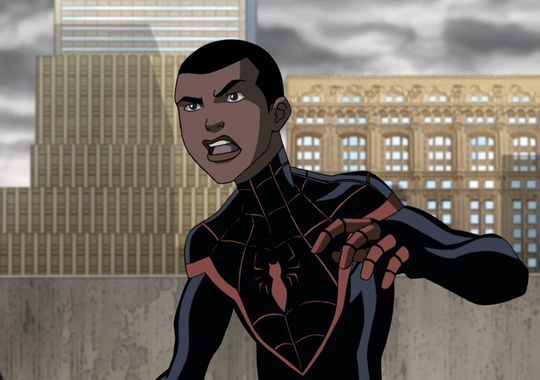 The show’s currently on its third season, and has renamed itself “Ultimate Spider-Man: Web-Warriors.” This season features Peter joining the Avengers, and a storyline involving Peter teaming up with counterparts from across parallel universes, similar to the upcoming comic storyline “Spider-Verse.” One of these counterparts is teen hero Miles Morales, who’s making his animation debut. (An earlier episode briefly showed a “regular” universe version of Miles, as just an ordinary powerless student.) Miles will keep his comic version’s backstory: a young high school student who’s gained spider-powers, and is trying to fill the shoes of the recently deceased Peter Parker. Miles in this series is voiced by Donald Glover, an actor in NBC’s TV show “Community,” which I’ve never seen. Apparently, however, Donald Glover is a fan of Spider-Man, both Miles and Peter. (Regarding Glover’s comments in USA Today about not liking Superman since Supes “can’t die,” I’d say the same about the fellow corporate cash-cows Glover cited liking, Spidey and Batman.) Also apparently, Donald Glover is no relation to Danny Glover of “Lethal Weapon” fame, the Glover that keeps crossing my mind (though it might be showing my age/tastes). The episodes featuring Miles are set to air next year. For more details, including Glover’s involvement and a clip from the episode, here’s an article in USA Today.